The new Modulyzer from Anton Paar can now perform density, refractive index and optical rotation measurements in one, modular and flexible system. Anton Paar introduces the new Modulyzer for Flavor and Fragrances, a state-of-the-art innovation which will improve both the measurement process itself, as well as the desired product quality by improving the repeatability. 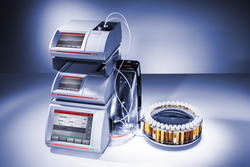 The new Modulyzer is one system that combines a DMA Generation M density meter , with an Abbemat refractometer, and an MCP polarimeter. In addition, an Anton Paar sample changer is used for automated sample filling, rinsing and drying of the measuring system. Measurement of density, refractive index and optical rotation play a key role in the production process, to ensure product quality and consistency. In every step of the process – from the raw material, to intermediate and final products - there is a need to measure these parameters accurately and reliably, in a short time, and with a low sample volume. The Modulyzer provides reproducible results, saves time and money while requiring only a small sample volume and minimal workbench space. For more information about the Modulyzer for Flavor and Fragrances, visit http://www.anton-paar.com.